Surviving Mesothelioma - Is It Always A Death Sentence? Mesothelioma Survivor Paul Kraus, Alive And Well 20 Years After Writing “Surviving Mesothelioma And Other Cancers"
This website was created to share the inspiring story of Paul Kraus with newly diagnosed mesothelioma patients and their loved ones. In the summer of 1997, Paul Kraus was diagnosed with mesothelioma and given only a few months to live. Rather than give up, Paul spoke with doctors from all over the world and with their help created a unique treatment plan. This plan involved the use of various types of therapies. Focused on recovering his health and outliving his prognosis, Paul followed the advice of his physicians carefully. Paul stayed with his treatment plan and today he has outlived his prognosis by over two decades. 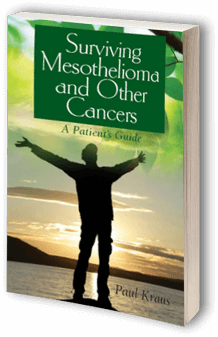 Many mesothelioma patients were interested in what Paul did and so he wrote this book, “Surviving Mesothelioma and Other Cancers: A Patient’s Guide,” to explain his philosophy of healing and the decisions that he made. This book discusses the approaches and healing philosophies Paul used in his own journey to survive mesothelioma. Request your free copy by clicking here. What Does a Mesothelioma Diagnosis Mean? Mesothelioma is a rare, aggressive form of cancer that develops in the lining of the lungs, abdomen, or heart. Mesothelioma is caused by exposure to asbestos. Although this cancer has a poor prognosis, there are many long-term survivors. The stage of the disease, cell type, location, and subtype (i.e. pleural or peritoneal) are some of the most important factors for a patient’s survival. Additional factors that have an impact on life expectancy include the overall health of the patient at the time of diagnosis, age of the patient, whether or not the cancer has spread, and treatments chosen. Typically, Stage1 and Stage 2 mesothelioma may be treated effectively with surgery and other forms of therapy. However, palliative care options are generally the only treatment options available for Stage 3 and Stage 4 mesothelioma, unless the patient selects a clinical trial or alternative approaches. Standard treatment options for mesothelioma patients are similar to the treatment options associated with other forms of cancer and include: surgery, chemotherapy, and radiation therapy. Usually, a combination of these treatments (surgery and chemotherapy/radiation therapy) is used in an effort to combat this disease. For people who do not respond well to conventional treatments, newer treatments studied in clinical trials may be available. Mesothelioma treatments can be used as a means to improve the patient’s prognosis and extend the life expectancy of a patient, or can be used palliatively to reduce pain and discomfort associated with mesothelioma. What Do I Do Now I Have Been Diagnosed With Mesothelioma? A diagnosis of mesothelioma can be frightening, confusing, and frustrating. Mesothelioma is a rare and aggressive form of cancer that is challenging to treat. However, once a definitive diagnosis is obtained, the primary goal of the patient is to live as long as possible with this rare cancer. There are multiple steps a patient can take in order to extend their life after a mesothelioma diagnosis. Seek a second opinion about your diagnosis from a mesothelioma specialist. Mesothelioma may be difficult to diagnose and easy to misdiagnose, therefore, seeking a second opinion for confirmation can be smart. Explore all your treatment options such as conventional, clinical trials, and alternative approaches. If the disease is diagnosed in the early stages, conventional therapies such as surgery may be helpful. In more advanced cases, other options should be explored because conventional treatments are limited. Meet with more than one doctor and make sure these doctors have a track record of success with mesothelioma. Improving diet and exercise will improve your overall health and may improve your response to treatment. As a patient, your overall goal should be to have good quality and life and live as long as possible once a diagnosis has been reached. This means keeping an open mind to the entire universe of treatment options. What Support Is There For Mesothelioma Sufferers? Patients with mesothelioma need support in many ways including physically, emotionally, and financially. There are foundations and organizations across the country that are ready to help. Support groups can offer mesothelioma patients renewed hope as they help mesothelioma patients connect with each other and share their experience living with the disease. This sense of camaraderie can give mesothelioma patients a sense of control and empowerment and this sense of control can reduce the feelings of anxiety, loneliness and depression. In addition, support groups allow patients to share knowledge about doctors, cancer centers, and treatments that have been successful. Support groups are available in-person, via telephone, and online to allow patients to choose the format that best suits them. It is not uncommon for patients to have to travel to the best mesothelioma specialists for treatment. There are organizations that give free flights to patients with mesothelioma and other forms of cancer. When patients receive treatment at hospitals, there is often discounted housing available for families and nearby hotels usually offer reduced rates. There are several type of financial compensation available to offset the costs associated with mesothelioma treatments. These include: legal claims (lawsuits and claims against asbestos trust funds), and VA claims. Many companies put asbestos deliberately into products long after they knew that asbestos was dangerous and could cause disease. Today, these companies are responsible for compensating mesothelioma victims. More information about the legal side if the disease is available here. Have you just been diagnosed with mesothelioma? Not sure where to start? Mary Green Edmonds is here to help. She is a patient advocate and our mesothelioma expert. She knows what treatments are working right now and which doctors have had the most success treating mesothelioma. You know how scary it can be, the moment the doctor gives you the diagnosis? Not knowing how you’re going to survive this disease? And that’s why we are making sure that Mary is available to take your call. Once you call our toll-free number you can talk to Mary, get the answers to your questions about mesothelioma, and save thousands of hours of research. Call Mary Green-Edmonds at (888) 378-1331 and get the information you need now.